How do we as Christians enjoy and exercise the freedom that we have in Christ, while taking special care not to stumble other believers? The question of when our liberty becomes a liability is the topic of this series of studies by Pastor Jack Abeelen as he opens up the text of 1 Corinthians 8-10 and examines what the Bible says about this delicate balance. When does liberty become a liability? "But when you thus sin against the brethren, and wound their weak conscience, you sin against Christ" (1 Corinthians 8:12). This is a statement that Paul made concerning personal conduct that is not prohibited by Scripture because of the freedom that we have in Jesus Christ, but may still offend the sensitive conscience of a brother or sister in the Lord. How do we as Christians enjoy and exercise the freedom that we have in Christ, while taking special care not to stumble other believers? 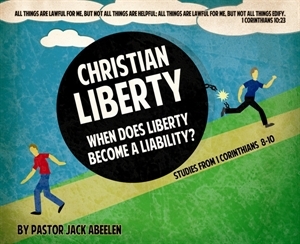 The question of when our liberty becomes a liability is the topic of this series of studies by Pastor Jack Abeelen as he opens up the text of 1 Corinthians 8-10 and examines what the Bible says about this delicate balance.